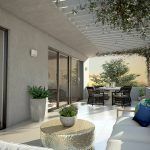 Parc presents a boutique collection of 18 one, two and three-bedroom apartments, the majority taking advantage of a desirable sun-soaked northerly aspect. Each apartment comes with secure parking. These innovative apartments reflect Mascot’s fashionable evolution into a vibrant urban hub. 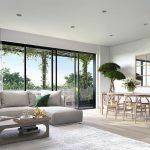 Parc adjoins the lush green expanse of John Curtin Memorial Reserve which feels much like your own private backyard, bringing a sense of calm and tranquility to the rapidly transforming surroundings. 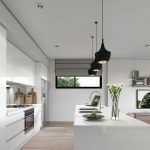 Kitchens have a minimalist monochrome aesthetic, with engineered white stone benchtops, white polyurethane cabinetry and mirrored splashbacks. Appointed with Miele appliances and gas cooktops, black pendant dome lights hang over the island benches for a dramatic effect. Bathrooms are appointed in tonal grey and white tiles for a cool, modern feel, enhanced by quality Parisi ceramic ware, chrome tapware along with heated towel rails. Parc’s private balconies and courtyards are generous and highly functional, some with shaded pergolas. Air-conditioned for extra comfort, bedrooms have built in wardrobes and rich charcoal wool carpets.